Centaur Media creates expert content and insight, engaging events and smart digital technology. Two of Centaur Media’s biggest annual events includes Marketing Week Live and Insight, bringing together forward-thinking marketers, offering inspiration through practical advice and idea sharing. 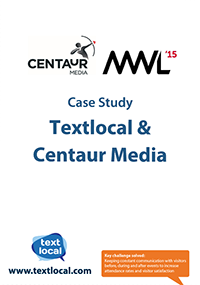 Centaur Media required a reliable, non-time consuming method to communicate with Marketing Week Live and Insight visitors before, during and following the events. Communicating with the event visitors via SMS meant that visitors were contacted in real-time, with reminders and updates of important information, encouraging event attendance and online engagement. Contacting visitors via SMS reminders assisted towards a remarkable turnout of over 6,500 visitors for both events. The series of SMS contained short links that generated an increase in traffic by hundreds of additional visitors to the MWL webpages. SMS proved to be extremely time effective during such a busy event by using the SMS scheduling tool in Messenger.